Ellis Island was the largest immigration station in the United States from 1892 to 1924. Over 12 million immigrants came through Ellis Island during this period. The island was nicknamed the "Island of Hope" for many immigrants coming to America to find a better life. 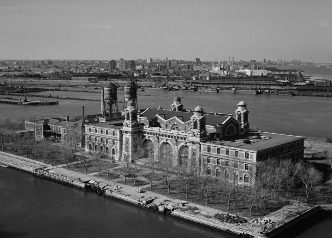 Ellis Island operated from 1892 to 1954. The federal government wanted to take control of immigration so it could make sure that immigrants didn't have diseases and were able to support themselves once they arrived in the country. Who was the first immigrant to arrive? The first immigrant to arrive was 15-year-old Annie Moore from Ireland. Annie had come to America with her two younger brothers to reunite with her parents who were already in the country. Today, there is a statue of Annie on the island. How many people came through Ellis Island? Over 12 million people were processed through Ellis Island between 1892 and 1924. After 1924, the inspections were done before people got on the boat and inspectors on Ellis Island just checked their papers. Around another 2.3 million people came through the Island between 1924 and 1954. Ellis Island started out as a small island of only around 3.3 acres. Over time, the island was expanded using landfill. By 1906, the island had grown to 27.5 acres. What was it like on the island? At its peak, the island was a crowded and busy place. In many ways, it was its own city. It had its own power station, a hospital, laundry facilities, and cafeteria. The scariest part for newcomers to the island was the inspection. All immigrants had to pass a medical inspection to make sure they weren't sick. Then they were interviewed by inspectors who would determine if they could support themselves in America. They also had to prove they had some money and, after 1917, that they could read. The people that passed all the tests were usually done with the inspections in three to five hours. However, those that couldn't pass were sent home. Sometimes children were separated from their parents or one parent was sent home. For this reason, the island also had the nickname the "Island of Tears." Today, Ellis Island is part of the National Park Service together with the Statue of Liberty. Tourists can visit Ellis Island where the main building is now an immigration museum. It has had several names in history including Gull Island, Oyster Island, and Gibbet Island. It was called Gibbet Island because pirates were hung on the island in the 1760s. Immigration to the United States slowed after the National Origins Act of 1924. The island served as a fort during the War of 1812 and an ammunition supply depot during the Civil War. The island is owned by the federal government and is considered part of both New York and New Jersey. Ellis Island's busiest year was 1907 when over 1 million immigrants passed through. The busiest day was on April 17, 1907 when 11,747 people were processed.